The naturally occurring hydrothermal system at Valles is subdivided into the Redondo, Sulphur Springs, and Jemez Springs geothermal areas based on the distribution of springs and fumaroles, past geothermal exploration projects, and scientific drilling programs. Surface discharges at Redondo and Sulphur Springs are fed by upwelling fluids from chemically distinct, isolated reservoirs beneath the caldera floor. Waters from these reservoirs also feed the Jemez Springs system outside the caldera walls to the southwest, reaching the springs primarily by structurally controlled lateral outflow and by more minor flow through Paleozoic strata. The locations of these geothermal areas and the Fenton Hill Hot Dry Rock (HDR) Project are shown in Figure 1. The Redondo Geothermal Area--formerly known as the Baca Geothermal System or Baca Geothermal Field during the time that Unocal owned the geothermal lease'"`UNIQ--ref-00000024-QINU`"'--is located in the southwestern portion of the Valles Caldera beneath the Redondo Peak’s resurgent dome. Union Oil Company (Unocal) drilled a series of 24 wells into a portion of this resurgent dome, which yielded a considerable amount of data regarding the subsurface stratigraphy, structure, and temperature of the Redondo Reservoir.'"`UNIQ--ref-00000025-QINU`"' Reservoir fluids sampled from the Bandelier Tuff in drill hole Baca-13 are hydrothermal brines that contain up to 1910 mg/L Cl-.'"`UNIQ--ref-00000026-QINU`"''"`UNIQ--ref-00000027-QINU`"' Maximum temperature encountered over the course of the project was 342°C in the deepest well, Baca-12, which was drilled to a depth of 3.2 km. The project was ultimately abandoned when the overall volume of the reservoir proved to be too small for commercial development." cannot be used as a page name in this wiki. The Valles Caldera is located in the Jemez Mountains volcanic field of north-central New Mexico. Valles is the type example of a resurgent caldera system, and is host to a long-lived < 300°C geothermal system. Documentation of hot spring occurrences of the Jemez Plateau dates back to before 1913, and includes descriptions of discharges at Jemez Springs and Sulphur Springs. From 1968 – 1970, the U.S. Geological Survey (USGS) conducted several early studies describing the caldera geology, stratigraphy, and structure. Bailey et al. (1969) originally described the intracaldera volcanic stratigraphy as (from youngest to oldest) the Banco Bonito, El Cajete, and Battleship Rock Members of the Valles Rhyolite based on surface mapping of the caldera. The caldera stratigraphy has since been refined based on surface geologic mapping and lithologies from scientific drill holes. Numerous geochronology studies have also contributed to the interpreted stratigraphy and eruptive history of the caldera. Ages of spring deposits, eruptive units, and core samples of vein minerals and altered host rocks have been determined through 14C, K-Ar, Ar-Ar, U series,  thermoluminescence, and Electron Spin Resonance (ESR) dating methods. The U.S. government purchased the caldera in 2000 and designated it the Valles Caldera National Preserve, with the intention of protecting its unique geology and scenic beauty while promoting scientific investigations including the preparation of detailed geologic maps. The Redondo Geothermal Area--formerly known as the Baca Geothermal System or Baca Geothermal Field during the time that Unocal owned the geothermal lease--is located in the southwestern portion of the Valles Caldera beneath the Redondo Peak’s resurgent dome. Union Oil Company (Unocal) drilled a series of 24 wells into a portion of this resurgent dome, which yielded a considerable amount of data regarding the subsurface stratigraphy, structure, and temperature of the Redondo Reservoir. Reservoir fluids sampled from the Bandelier Tuff in drill hole Baca-13 are hydrothermal brines that contain up to 1910 mg/L Cl-. Maximum temperature encountered over the course of the project was 342°C in the deepest well, Baca-12, which was drilled to a depth of 3.2 km. The project was ultimately abandoned when the overall volume of the reservoir proved to be too small for commercial development. Ownership of Baca Location No. 1, which encompassed Valle Grande, Valle San Antonio, Valle Santa Rosa, and Redondo Creek, was awarded to the family of Francisco Tomás Baca in 1860 as a part of an exchange that settled a dispute over the land rights to what was then known as the Town of Las Vegas. Ongoing disagreements over ownership, inheritance, and outside interests in the increasingly partitioned land claim led to numerous commercial, legal, and occasionally bloody disputes during the late nineteenth century. Ownership of various claims within the land package changed hands several times during this period. The caldera has been the site of numerous logging operations since gold and silver were discovered south of the property in 1889, which spurred demand for timber needed for major mines and boomtowns that subsequently sprang up in the area. Logging activities were concluded in 2001 following the U.S. government’s purchase of the Baca Location No. 1 in 2000. The caldera has also been used as grazing land for horses, cattle, and sheep by various parties throughout its ownership history, with operations continuing through 2002. A complete history of ownership and development of the Valles Caldera can be found in Merlan and Anschuetz (2007). Geothermal exploration at Valles began in 1959 when Unocal drilled a series of wells into a portion of the Redondo Peak Resurgent Dome as a part of a development program within what was known as the Baca Project Area (now referred to as the Redondo Geothermal Area). Drilling results defined a high temperature reservoir beneath the resurgent dome; however, the overall volume of the system was ultimately deemed to be too small for commercial development and the project was abandoned in 1983. Drilling activities were continued as a part of the Continental Scientific Drilling Program (CSDP) between 1984 and 1988, during which time three core holes (VC-1, VC-2A, and VC-2B) were drilled to better understand the stratigraphy, structure, hydrothermal alteration, and subsurface architecture of the Valles Caldera. An additional core hole, VC-3, was drilled in 2004 as part of the GLAD5 project to investigate major climatic changes and glacial/interglacial cycles recorded in lacustrine sediments below Valle Grande. While the findings of this shallow core hole are significant with respect to paleoclimate research, they pose little relevance to the exploration for geothermal resources. Twenty-four wells were drilled into a portion of the Redondo Peak Resurgent Dome from 1959 to 1983 by Unocal as a part of a geothermal exploration and development program within what was known as the Baca Project Area (now referred to as the Redondo Geothermal Area). In 1984, Nielson and Hulen described the intracaldera volcanic stratigraphy in the vicinity of Redondo Peak based on detailed logging of subsurface samples from these wells, which provided insights that improved interpretation of the internal structure of the resurgent dome.'"`UNIQ--ref-0000003B-QINU`"' Maximum temperatures of 342°C were encountered in the deepest Unocal well, Baca-12, drilled to a depth of 3.2 km. A series of core holes were drilled from 1984 to 1988 as a part of the CSDP to better understand the stratigraphy, structure, hydrothermal alteration, and subsurface architecture of the Valles Caldera. Numerous studies have reported the results from these core holes, which include the VC-1 core hole drilled at Redondo Creek and the VC-2A and VC-2B core holes at Sulphur Springs.'"`UNIQ--ref-0000003C-QINU`"''"`UNIQ--ref-0000003D-QINU`"''"`UNIQ--ref-0000003E-QINU`"' '"`UNIQ--ref-0000003F-QINU`"''"`UNIQ--ref-00000040-QINU`"' '"`UNIQ--ref-00000041-QINU`"''"`UNIQ--ref-00000042-QINU`"''"`UNIQ--ref-00000043-QINU`"''"`UNIQ--ref-00000044-QINU`"' '"`UNIQ--ref-00000045-QINU`"''"`UNIQ--ref-00000046-QINU`"' '"`UNIQ--ref-00000047-QINU`"' '"`UNIQ--ref-00000048-QINU`"' '"`UNIQ--ref-00000049-QINU`"' The CSDP has greatly improved understanding of the intracaldera subsurface stratigraphy and structure, helped define the intracaldera reservoirs and the hydrothermal outflow plume along the Jemez Fault Zone, facilitated measurement of bottom hole temperatures, and allowed for the description of alteration and ore deposit analogues associated with the active hydrothermal system. Wilt and Haar (1986) carried out a series of geophysical surveys at the Redondo and Sulphur Springs geothermal areas within the caldera in hopes of outlining deep drilling targets.'"`UNIQ--ref-0000004A-QINU`"' These included telluric profiles, magnetotelluric sounding, DC resistivity, gravity, and electromagnetic sounding surveys that were integrated to help define the electrical structure in the reservoir region(s). The most useful of these were the telluric profiles and the magnetotelluric sounding data sets since those surveys provided a good penetration depth. Resistivity models were principally constructed from these data and were tested against the other geophysical data sets. Magnetotelluric results indicate a deep, low resistivity anomaly at the western edge of the caldera that is potentially associated with deep hot fluids. Density log data from Redondo Creek indicate three major density units within the well section that were differentiated for modeling purposes: a surface layer of caldera fill, lake deposits, and other recent alluvium (2.12 g/cm^3); the Bandelier Tuff and underlying volcanic and sedimentary units (2.3--2.5 g/cm^3); and the basement unit, consisting of the lower Paleozoic and the upper Precambrian (2.65 g/cm^3). Geophysical and well data were used to construct computer models that provide a general guide to subsurface structure; these models are useful for identifying large-scale changes. On the basis of geophysical and well data, the authors made three estimates of reservoir dimensions. In 1995, Roberts et al. described the experimental details, data analysis, and forward modeling for scattered-wave amplitude data recorded during a teleseismic earthquake survey performed in the Valles Caldera in the summer of 1987.'"`UNIQ--ref-0000004B-QINU`"' Twenty-four high-quality teleseismic events were recorded at numerous sites along a line spanning the ring fracture and at several sites outside of the caldera. A modification of the Aki-Lamer method was used to model the amplitude data. Results confirmed the presence of a shallow attenuating anomaly; they were used to estimate the quantitative parameters defining it. 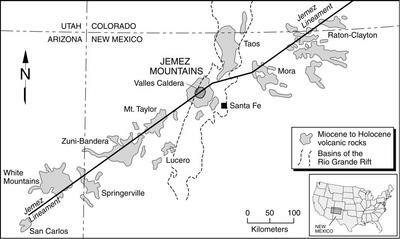 Teleseismic monitoring continued into the summer of 1994 through the Jemez Tomography Experiment (JTEX), a multidisciplinary effort to understand the structure of the Jemez volcanic field below the Valles Caldera. Steck et al. (1998) integrated data from several active and passive seismology, geology, gravity, and electromagnetic studies to produce a detailed 3-D model of the subsurface deep beneath the caldera. Inversion of 4,872 teleseismic P wave relative arrival times allowed for successful imaging of the Toledo Embayment (assumed to have formed during the collapse of the Toledo Caldera) and revealed a region that contains at least 10% melt between 5 and 15.5 km depth underlying the active hydrothermal features on the west side of the caldera. This low-velocity zone is thought to represent a new pulse of magma into the crust rather than residual Bandelier magma. Low velocities were also detected near the crust-mantle boundary, and are thought to relate to partial melting of the upper mantle and subsequent underplating of basaltic melt in the upper mantle and/or lower crust. Twenty-four wells were drilled into a portion of the Redondo Peak Resurgent Dome from 1959 to 1983 by Unocal as a part of a geothermal exploration and development program within what was known as the Baca Project Area (now referred to as the Redondo Geothermal Area). In 1984, Nielson and Hulen described the intracaldera volcanic stratigraphy in the vicinity of Redondo Peak based on detailed logging of subsurface samples from these wells, which provided insights that improved interpretation of the internal structure of the resurgent dome. Maximum temperatures of 342°C were encountered in the deepest Unocal well, Baca-12, drilled to a depth of 3.2 km. A series of core holes were drilled from 1984 to 1988 as a part of the CSDP to better understand the stratigraphy, structure, hydrothermal alteration, and subsurface architecture of the Valles Caldera. Numerous studies have reported the results from these core holes, which include the VC-1 core hole drilled at Redondo Creek and the VC-2A and VC-2B core holes at Sulphur Springs. The CSDP has greatly improved understanding of the intracaldera subsurface stratigraphy and structure, helped define the intracaldera reservoirs and the hydrothermal outflow plume along the Jemez Fault Zone, facilitated measurement of bottom hole temperatures, and allowed for the description of alteration and ore deposit analogues associated with the active hydrothermal system. Wilt and Haar (1986) carried out a series of geophysical surveys at the Redondo and Sulphur Springs geothermal areas within the caldera in hopes of outlining deep drilling targets. These included telluric profiles, magnetotelluric sounding, DC resistivity, gravity, and electromagnetic sounding surveys that were integrated to help define the electrical structure in the reservoir region(s). The most useful of these were the telluric profiles and the magnetotelluric sounding data sets since those surveys provided a good penetration depth. Resistivity models were principally constructed from these data and were tested against the other geophysical data sets. Magnetotelluric results indicate a deep, low resistivity anomaly at the western edge of the caldera that is potentially associated with deep hot fluids. Density log data from Redondo Creek indicate three major density units within the well section that were differentiated for modeling purposes: a surface layer of caldera fill, lake deposits, and other recent alluvium (2.12 g/cm^3); the Bandelier Tuff and underlying volcanic and sedimentary units (2.3--2.5 g/cm^3); and the basement unit, consisting of the lower Paleozoic and the upper Precambrian (2.65 g/cm^3). Geophysical and well data were used to construct computer models that provide a general guide to subsurface structure; these models are useful for identifying large-scale changes. On the basis of geophysical and well data, the authors made three estimates of reservoir dimensions. In 1995, Roberts et al. described the experimental details, data analysis, and forward modeling for scattered-wave amplitude data recorded during a teleseismic earthquake survey performed in the Valles Caldera in the summer of 1987. Twenty-four high-quality teleseismic events were recorded at numerous sites along a line spanning the ring fracture and at several sites outside of the caldera. A modification of the Aki-Lamer method was used to model the amplitude data. Results confirmed the presence of a shallow attenuating anomaly; they were used to estimate the quantitative parameters defining it. Teleseismic monitoring continued into the summer of 1994 through the Jemez Tomography Experiment (JTEX), a multidisciplinary effort to understand the structure of the Jemez volcanic field below the Valles Caldera. Steck et al. (1998) integrated data from several active and passive seismology, geology, gravity, and electromagnetic studies to produce a detailed 3-D model of the subsurface deep beneath the caldera. Inversion of 4,872 teleseismic P wave relative arrival times allowed for successful imaging of the Toledo Embayment (assumed to have formed during the collapse of the Toledo Caldera) and revealed a region that contains at least 10% melt between 5 and 15.5 km depth underlying the active hydrothermal features on the west side of the caldera. This low-velocity zone is thought to represent a new pulse of magma into the crust rather than residual Bandelier magma. Low velocities were also detected near the crust-mantle boundary, and are thought to relate to partial melting of the upper mantle and subsequent underplating of basaltic melt in the upper mantle and/or lower crust. "Unocal drilled 24 wells into a portion of the Redondo Peak Resurgent Dome from 1959 to 1983 as a part of a geothermal exploration and development program within what was known as the Baca Project Area (now referred to as the Redondo Geothermal Area). In 1984, Nielson and Hulen described the intracaldera volcanic stratigraphy in the vicinity of Redondo Peak based on detailed logging of subsurface samples from these wells, which provided insights that improved interpretation of the internal structure of the resurgent dome. Maximum temperatures of 342°C were encountered in the deepest Unocal well, Baca-12, which was drilled to a depth of 3.2 km. The VC-1 core hole drilled at Redondo Creek and the VC-2A and VC-2B core holes drilled at Sulphur Springs as part of the CSDP from 1984 to 1988 have been the subject of numerous studies of the stratigraphy, structure, hydrothermal alteration, and subsurface architecture of the Valles Caldera.'"`UNIQ--ref-0000004F-QINU`"''"`UNIQ--ref-00000050-QINU`"''"`UNIQ--ref-00000051-QINU`"' '"`UNIQ--ref-00000052-QINU`"''"`UNIQ--ref-00000053-QINU`"' '"`UNIQ--ref-00000054-QINU`"''"`UNIQ--ref-00000055-QINU`"''"`UNIQ--ref-00000056-QINU`"''"`UNIQ--ref-00000057-QINU`"' '"`UNIQ--ref-00000058-QINU`"''"`UNIQ--ref-00000059-QINU`"' '"`UNIQ--ref-0000005A-QINU`"' '"`UNIQ--ref-0000005B-QINU`"' '"`UNIQ--ref-0000005C-QINU`"' An additional core hole, VC-3, was drilled in 2004 as part of the GLAD5 project to investigate major climatic changes and glacial/interglacial cycles recorded in lacustrine sediments below Valle Grande. While the findings of this shallow core hole are significant with respect to paleoclimate research, they pose little relevance to the exploration for geothermal resources." cannot be used as a page name in this wiki. Unocal drilled 24 wells into a portion of the Redondo Peak Resurgent Dome from 1959 to 1983 as a part of a geothermal exploration and development program within what was known as the Baca Project Area (now referred to as the Redondo Geothermal Area). In 1984, Nielson and Hulen described the intracaldera volcanic stratigraphy in the vicinity of Redondo Peak based on detailed logging of subsurface samples from these wells, which provided insights that improved interpretation of the internal structure of the resurgent dome. Maximum temperatures of 342°C were encountered in the deepest Unocal well, Baca-12, which was drilled to a depth of 3.2 km. The VC-1 core hole drilled at Redondo Creek and the VC-2A and VC-2B core holes drilled at Sulphur Springs as part of the CSDP from 1984 to 1988 have been the subject of numerous studies of the stratigraphy, structure, hydrothermal alteration, and subsurface architecture of the Valles Caldera. An additional core hole, VC-3, was drilled in 2004 as part of the GLAD5 project to investigate major climatic changes and glacial/interglacial cycles recorded in lacustrine sediments below Valle Grande. While the findings of this shallow core hole are significant with respect to paleoclimate research, they pose little relevance to the exploration for geothermal resources. The natural geothermal reservoirs within the Valles Caldera have not been developed for commercial electricity production although the field is capable of producing about 20 MWe.. However, the adjacent Fenton Hill HDR Project to the west has been the subject of some of the first reservoir engineering, fluid circulation/recovery, and power generation experiments with applications in Enhanced Geothermal Systems (EGS). The Fenton Hill HDR Project was the first development project of its kind, and so faced a number of unique challenges that may be used to inform the design and implementation of future EGS projects. The most prominent technical issue was the orientation of the induced fracture pattern in the Phase II reservoir, which initially failed to promote hydraulic communication between the injection and production wells. This issue stemmed from the fact that the injection and production wells at Fenton Hill were drilled prior to fracturing hot crystalline reservoir rocks, which resulted in poor connectivity between the wells and low recovery of the heated fluid. The injection well (EE-3A) was ultimately redrilled to intersect the fracture network produced in the Phase II reservoir. Perhaps the most crucial lesson gained from the Fenton Hill HDR Project is that the stimulated volume of hot rock should be fractured from the initial borehole prior to the drilling of production boreholes near the long-axis boundaries on either side of the ellipsoidal seismic reservoir volume. To first drill two boreholes and then try to connect them by hydraulic fracturing, as was initially attempted at the site, is nearly impossible. The use of two production wells would also (in theory) double the productivity of the Phase II reservoir and would allow for a sustained thermal power production level of about 20 MW over a period of at least 15 years. Additionally, a second production well would allow for maintenance of even higher reservoir pressures, which would result in greater dilation of the flowing joints and reduce the body impedance while also constraining additional reservoir growth. The Valles Caldera is a Quaternary volcanic collapse feature with a diameter of 22 km. It was formed by the latest catastrophic volcanic eruption in the Jemez Mountains volcanic field of north-central New Mexico at 1.25 Ma. The caldera itself is situated at the intersection of the Jemez Lineament and the western edge of the Rio Grande Rift. The Rio Grande Rift is a major extensional feature consisting of a series of north-trending asymmetric sedimentary basins separated by transfer and scissor fault zones that stretches over 1,000 km from Leadville, CO to Chihuahua, Mexico. Rifting was preceded by northeast-southwest compression that created foreland basins and uplifted fault blocks during the Late Cretaceous Laramide Orogeny. This period was followed by a shift to backarc extensional tectonics during the Cenozoic, with formation of the Rio Grande Rift beginning at about 30 Ma and lasting until approximately 18 Ma. Extension also initiated a minor period of primarily basaltic volcanic activity that produced large shield volcanoes, cinder cones, fissures, flood-basalts, and tuffaceous ash layers. Rifting continued during a second period of tectonic activity lasting from approximately 10 Ma to 3 Ma, and was accompanied by a major period of volcanism beginning approximately 5 Ma. Igneous rocks of the Rio Grande Rift formed during this time contrast sharply with those of the Jemez volcanic field. A series of basaltic through rhyolitic eruptions between 16.5 Ma and 40 ka form a northeast-trending chain of volcanic centers that define the Jemez Mountains volcanic field, which lies along the Jemez Lineament. The Jemez Lineament is thought to be a major zone of weakness in the lithosphere and is not defined by a single through-going fault of fracture. Figure 2 shows the locations of the Valles Caldera, Rio Grande Rift, and Jemez Lineament in north-central New Mexico. An estimated volume of 400-475 km^3 of high-silica rhyolitic ignimbrite was produced by each of the caldera-forming eruptions of the Jemez Mountains volcanic field, and was deposited as a non-welded to densely welded tuffaceous unit (the Bandelier Tuff) of varying thickness that covered the surrounding topography. Ignimbrites deposited during the explosive formation of the Valles and Toledo calderas are exposed at Valles and throughout the surrounding region, and consist of the upper Tshirege (Qbt) and lower Otowi (Qbo; c.a. 1.6 Ma) members of the Bandelier Tuff, commonly referred to as the upper and lower Bandelier Tuffs, respectively. The most recent 40Ar/39Ar date on the upper Bandelier Tuff is 1.256+0.010 Ma, and defines the timing of eruption of the Valles Caldera. Volcanics exposed throughout the Jemez Mountains volcanic field are largely unaltered, although both fresh and hydrothermally altered tuffs are present in the caldera center and topographic rim. Drill holes and gravity investigations within the caldera indicate that the caldera depression is filled by as much as 2,000 m of densely welded ignimbrite and that the caldera is asymmetric, being considerably deeper in the east than in the west. The La Cueva member (Qblc), recently redefined as the basal member of the Bandelier Tuff, is a lithic-rich, pumiceous, rhyolitic ignimbrite that is traceable for nearly 20 km in San Diego Canyon to the southwest of the caldera. The Bandelier Tuff is underlain by porphyritic dacite and andesite domes and lava flows (Ttu, Tpa), and Tertiary basin-fill sediments and volcaniclastic deposits of the Santa Fe Group (Ts, Tsf, Tscu) to the east. These rocks thin beneath the western side of the caldera, and are underlain by Permian strata (Pu), Mississippian-Pennsylvanian sedimentary rocks (MIPu, including the Madera Formation limestone), and Precambrian crystalline basement rocks (pC) of the Colorado Plateau. Shortly after the eruption of the upper Bandelier Tuff, erosion of the caldera walls formed talus slopes, alluvial fans, and debris flow deposits that thin towards the center of the crater. During this time, an intracaldera lake formed, depositing laminated to bedded lacustrine sediments (Qvs). The floor of the caldera began to rise, forming the Redondo Peak Resurgent Dome, and relatively small volumes of rhyolite lava and tuff erupted from the caldera center. These steeply- to moderately-dipping rock units overlie the upper Bandelier Tuff, and are exposed along the middle and lower flanks of the resurgent dome. Co-resurgence eruptive members of the Valles Rhyolite include the porphyritic Deer Canyon Lava (Qdc) and lithic tuff (Qdct) and the overlying Redondo Creek Lava (Qrc), all of which are interbedded with lacustrine and debris flow deposits (Qdf). The most recent 40Ar/39Ar dates range from 1.25+0.02 to 1.26+0.02 for the Deer Canyon lavas and 1.21+0.02 to 1.26+0.04 Ma for the Redondo Creek lava, limiting the duration of co-resurgence volcanism to approximately 27 ka after formation of the caldera. The Valles Rhyolite also includes a series of post-resurgence moat rhyolites that overly the Redondo Creek lavas; they erupted between 1.23 Ma and about 40 ka. These units form a series of rhyolitic flow and dome complexes that are distributed in a counterclockwise arc beginning with the oldest dome on the eastern side of the caldera and the youngest dome located southeast of Redondo Peak. From oldest to youngest, these eruptive units are the Cerro del Medio (Qvdm), Cerros del Abrigo (Qvda), Cerro Santa Rosa (Qvsr), Cerro San Luis (Qvsl), Cerro Seco (Qvse), San Antonio Mountain (Qvsa), and South Mountain (Qvsm) members of the Valles Rhyolite. Recent geologic mapping of the caldera has revealed that deposition of post-resurgence moat rhyolites was accompanied by at least three periods of lacustrine sedimentation (Ql) at roughly 0.8 Ma, 0.5 Ma, and 55 ka. The East Fork Member of the Valles Rhyolite represents the most recent series of volcanic units erupted between about 60-40 ka, and includes the Battleship Rock Ignimbrite (Qvbr), El Cajete Pyroclastic Beds (Qvec), and the Banco Bonito Flow (Qvb). These units were recognized during initial geologic mapping of the caldera, and are concentrated in the southwestern moat zone adjacent to Redondo Peak and South Mountain. Rocks of the East Fork Member are texturally distinct and are readily distinguishable in the field: the Battleship Rock Ignimbrite consists of a sequence of pyroclastic deposits that form a prominent cliff where the Jemez River forks to the east; the El Cajete Pyroclastic Beds are a series of mantle-bedded air fall deposits made up of pumice lapilli and blocks; and the Banco Bonito Flow is a porphyritic obsidian flow deposit that fills the southwestern caldera moat. The subsurface stratigraphy of the Valles Caldera in the vicinity of the Redondo Peak Resurgent Dome is shown in Figure 3 (below). Figure 3. Southwest-northeast cross section through the Valles Caldera. The section transects the Valles and Toledo ring fracture zones, the Redondo Creek Graben, and the Jemez Fault Zone on the southwestern margin of the caldera. "The age of the Valles Caldera hydrothermal system has been dated to be about 1 Ma,'"`UNIQ--ref-000000A2-QINU`"' indicating rapid initiation of hydrothermal activity following formation of the caldera at 1.25 Ma.'"`UNIQ--ref-000000A3-QINU`"''"`UNIQ--ref-000000A4-QINU`"' Reservoir geofluids encountered during drilling within the caldera are neutral-chloride waters (on the order of several thousand mg/L Cl-) between 250-300°C '"`UNIQ--ref-000000A5-QINU`"' that contain approximately 5000-18,000 mg/kg total dissolved solids.'"`UNIQ--ref-000000A6-QINU`"' These fluids are interpreted to be deeply circulating old meteoric waters,'"`UNIQ--ref-000000A7-QINU`"' and do not resemble any of the surface hot springs within the caldera in terms of their chemical composition.'"`UNIQ--ref-000000A8-QINU`"' Isotopic and thermal data indicate the hydrothermal system is dominated by relatively recent meteoric recharge that reaches depths of 2-3 km and temperatures of about 300°C.'"`UNIQ--ref-000000A9-QINU`"' 36Cl/Cl ratios indicate that these fluids evolve into highly saline geothermal brines by leaching chloride from Precambrian basement and Paleozoic rocks, and limit subsurface residence times to <100,000 years.'"`UNIQ--ref-000000AA-QINU`"' Geofluids then become entrained in convective upflow along faults and fractures to depths of 500-600 m, and then flow laterally to the southwest along the Jemez fault.'"`UNIQ--ref-000000AB-QINU`"''"`UNIQ--ref-000000AC-QINU`"''"`UNIQ--ref-000000AD-QINU`"' The 20-km-long fault system serves as a conduit that channels thermal waters away from the upflow plume, resulting in hot springs and other surface manifestations of variably mixed hydrothermal fluids outside the caldera wall.'"`UNIQ--ref-000000AE-QINU`"' As such, the Jemez Fault Zone serves as the principle discharge from the Sulphur Springs and Redondo reservoirs that feeds the neutral-chloride hot springs at Soda Dam and at Jemez Springs in San Diego Canyon along the Jemez River, although some discharge outside the caldera results from limited lateral flow through permeable Paleozoic strata.'"`UNIQ--ref-000000AF-QINU`"''"`UNIQ--ref-000000B0-QINU`"''"`UNIQ--ref-000000B1-QINU`"' In contrast, hot and cold springs in the western moat zone of the caldera have lower temperatures below 40°C, lower Cl- concentrations between 2-7 mg/L, and are thought to be recharged by recent meteoric waters that are variably heated by shallow circulation through the ring fracture zone of the caldera.'"`UNIQ--ref-000000B2-QINU`"' Dates on the travertine deposits of the Soda Dam area indicate that the outflow plume has been part of the Valles hydrothermal system for approximately '"`UNIQ--math-000000B3-QINU`"' years, and that travertine formation occurred in at least three distinct episodes of deposition.'"`UNIQ--ref-000000B4-QINU`"'" cannot be used as a page name in this wiki. The age of the Valles Caldera hydrothermal system has been dated to be about 1 Ma, indicating rapid initiation of hydrothermal activity following formation of the caldera at 1.25 Ma. Reservoir geofluids encountered during drilling within the caldera are neutral-chloride waters (on the order of several thousand mg/L Cl-) between 250-300°C  that contain approximately 5000-18,000 mg/kg total dissolved solids. These fluids are interpreted to be deeply circulating old meteoric waters, and do not resemble any of the surface hot springs within the caldera in terms of their chemical composition. Isotopic and thermal data indicate the hydrothermal system is dominated by relatively recent meteoric recharge that reaches depths of 2-3 km and temperatures of about 300°C. 36Cl/Cl ratios indicate that these fluids evolve into highly saline geothermal brines by leaching chloride from Precambrian basement and Paleozoic rocks, and limit subsurface residence times to <100,000 years. Geofluids then become entrained in convective upflow along faults and fractures to depths of 500-600 m, and then flow laterally to the southwest along the Jemez fault. The 20-km-long fault system serves as a conduit that channels thermal waters away from the upflow plume, resulting in hot springs and other surface manifestations of variably mixed hydrothermal fluids outside the caldera wall. As such, the Jemez Fault Zone serves as the principle discharge from the Sulphur Springs and Redondo reservoirs that feeds the neutral-chloride hot springs at Soda Dam and at Jemez Springs in San Diego Canyon along the Jemez River, although some discharge outside the caldera results from limited lateral flow through permeable Paleozoic strata. In contrast, hot and cold springs in the western moat zone of the caldera have lower temperatures below 40°C, lower Cl- concentrations between 2-7 mg/L, and are thought to be recharged by recent meteoric waters that are variably heated by shallow circulation through the ring fracture zone of the caldera. Dates on the travertine deposits of the Soda Dam area indicate that the outflow plume has been part of the Valles hydrothermal system for approximately years, and that travertine formation occurred in at least three distinct episodes of deposition. "The heat source of the Valles Caldera Geothermal System is thought to be a silicic-magma chamber whose explosive eruption and subsequent collapse formed the Valles and Toledo calderas. Teleseismic surveys have detected a low velocity zone between 5 and 15.5 km that underlies the active hydrothermal features on the western side of the caldera.'"`UNIQ--ref-000000B5-QINU`"' This region is conservatively estimated to contain at least 10% melt that is thought to represent a new pulse of magma into the crust, and may contribute to the heat flux of the caldera system." cannot be used as a page name in this wiki. Numerous geochemical investigations have been conducted at Valles between 1982 and 2002, and include major/trace element and isotopic analyses of water and gas samples taken from hot springs, cold seeps, fumaroles, and wells throughout the caldera. Water chemistry studies were carried out to help interpret the geothermal potential of the Jemez Mountains region and to provide background data for investigating problems in hydrology, hydrothermal alterations, and hydrothermal solution chemistry; to investigate the applicability of 36Cl- as a tracer isotope for determining fluid pathways; to help determine the origin of chloride in the geothermal system; and better understand the fluid composition, thermal history, and fluid-rock mass transfer rates in the Redondo Geothermal Reservoir. Sampling and analysis of gas collected from springs, fumaroles, and wells was designed to improve understanding of the geologic setting of gas features with respect to the caldera, to investigate variations in gas compositions that occurred during drilling and flow testing of the Valles scientific wells, and to compare Valles gases with those at other geothermal sites. Investigations into the fluid composition and thermal history of the Redondo geothermal reservoir indicate the presence of a normal enthalpy, lower-chloride fluid and an excess enthalpy, higher-chloride fluid enriched in deuterium and 18O. These distinct chemical properties can be explained by adiabatic cooling or boiling of fluids at 170°C during upward convection along the central fault system in the reservoir, followed by conductive reheating during downward movement. Computer-based chemical modeling using the EQ3NR code indicates stability with the quartz-albite-K mica-epidote-chlorite-calcite-anhydrite-pyrite mineral assemblage, which is in agreement with observed minerals in well cuttings. Together, these results imply a constant temperature range of 260–320°C during evolution of the Redondo Reservoir. Despite these results, the overall volume of the system was ultimately deemed to be too small for commercial development. Estimates of fluid-rock mass transfer rates in the reservoir based on equilibrium constraints, fluid reservoir volume, and discharge rates suggest that fluid residence time is approximately 2,000 years, or <0.2% of the total age of the hydrothermal system. These results are suggestive of a geochemically and isotopically open system, in which Cl was the only aqueous component not controlled by mineral equilibrium. In 1988, Goff et al. integrated stratigraphic, temperature gradient, hydrogeochemical, hydrologic, and geologic data from VC-1 and from select geothermal test wells of the Fenton Hill HDR and Redondo geothermal projects in order to construct a comprehensive hydrologic and temperature gradient model of the hydrothermal outflow plume issuing from the western margin of the Valles Caldera. Hydrochemical data from aquifers sampled in the VC-1 core hole confirmed the existence of the outflow plume. Combination of this data with previous datasets showed that the outflow at Valles is complex, and is fed by at least two major fluid reservoirs (the Redondo and Sulphur Springs Reservoirs). Discharge rates, thermal gradients, relative heat flow estimates, and mixing relationships suggest that 25-50% of the lateral flow occurs along vertical conduits associated with the Jemez Fault Zone, with subordinate flow occurring in horizontal, semipermeable Paleozoic strata overlying Precambrian crystalline basement rocks. Paleozoic strata are nonhomogeneous in their lithology and so function as poorly connected zones of lateral flow, such that there is no single unique thermal aquifer outside of the western margin of the caldera. Several other geochemical studies were performed on the regional scale, and encompass the Jemez Springs, Sulphur Springs, and Redondo components of the hydrothermal system. Analysis of 36Cl- isotopes and interpretation of 36Cl/Cl ratios of waters sampled from three meteoric-dominated springs, seven high-temperature drill holes, and six surface hot springs indicates that deeply circulating meteoric waters derive their high chloride contents from Precambrian basement and Paleozoic rocks before ascending into more shallow volcaniclastic reservoirs, and that residence times for these waters are <100,000 years. 36Cl/Cl ratios also confirm previous classifications of the sampled waters as meteoric or thermal waters. In 2002, Goff and Janik reviewed geochemical results from approximately 80 gas analyses of samples obtained from fumaroles, springs, and wells over the previous two decades to better understand the geologic setting of gas features with respect to the caldera, to investigate variations in gas compositions that occurred during drilling and flow testing of the Valles scientific wells, and to compare Valles gases with those at other geothermal sites, including the Yellowstone and Long Valley calderas. The study confirmed that Valles gases are chemically and isotopically similar to those in other volcanic-hosted geothermal systems, and that the gases are in apparent equilibrium at temperatures >200°C. Relative proportions of Ar, He, and N2 are similar to those measured at hot spot locations such as Yellowstone and Kilauea. He R/Ra values of 4-6 within the caldera are suggestive of mantle/magmatic degassing whereas R/Ra values of 0.7 outside the caldera reflect a He input dominated by U/Th decay in crustal rocks. Major gas components of the caldera surface discharges remained relatively constant during sampling and well stimulation, and generally resemble gas compositions of the geothermal wells. This excludes the Footbath acid spring, whose gas composition changed noticeably during six years of drilling and flow testing of the VC-2A and VC-2B wells. The study also revealed that Valles Caldera gases contained relatively little CH4 and N2 compared to other geothermal systems hosted within sedimentary rocks, suggesting that organic carbon and nitrogen in Paleozoic and Miocene strata were depleted during 13 million years of magmatism in the Jemez Volcanic Field. Valles Caldera Geothermal Systems, New Mexico, U.S.A.
↑ Robert Leland Smith,Roy A. Bailey,Clarence Samuel Ross. Geologic Map of the Jemez Mountains, New Mexico. [Map]. Place of publication not provided. U.S. Geological Survey. 1970. Scale 1:250,000. Available from: http://pubs.er.usgs.gov/publication/i571. ↑ 8.0 8.1 8.2 8.3 Roy A. Bailey,Robert Leland Smith,Clarence Samuel Ross. 1969. Stratigraphic Nomenclature of Volcanic Rocks in the Jemez Mountains, New Mexico. Washington D.C.: U.S. Geological Survey. 19p. ↑ 22.00 22.01 22.02 22.03 22.04 22.05 22.06 22.07 22.08 22.09 22.10 Erin H. Phillips. 2004. Collapse and Resurgence of the Valles Caldera, Jemez Mtns, NM- 40Ar/39Ar Ages of Megabreccia Blocks and Age Constraints on Timing and Duration of Resurgence [Thesis]. [Socorro, N.M.]: New Mexico Institute of Mining and Technology. ↑ 31.0 31.1 31.2 31.3 31.4 31.5 31.6 Fraser E. Goff,Lisa Shevenell,Jamie N. Gardner,Francois D. Vuataz,Charles O. Grigsby. 1988. The Hydrothermal Outflow Plume of Valles Caldera, New Mexico, and a Comparison with Other Outflow Plumes. Journal of Geophysical Research. 93(B6):6041-6058. ↑ 32.0 32.1 32.2 32.3 32.4 32.5 32.6 D. L. Nielson,J. B. Hulen. 1984. 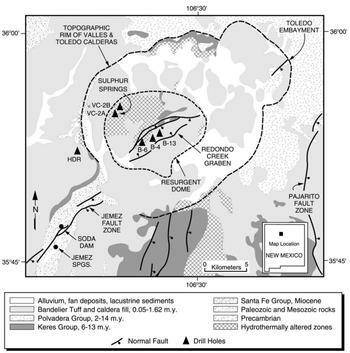 Internal Geology and Evolution of the Redondo Dome, Valles Caldera, New Mexico. Journal of Geophysical Research. 89:8695-8711. ↑ 33.0 33.1 33.2 F.M. Phillips,Fraser E. Goff,Francois D. Vuataz,H.W. Bentley,H.E. Gove. 1984. 36Cl as a tracer in geothermal systems- Example from Valles Caldera, New Mexico. Geophysical Research Letters. 11(12):1227-1230. ↑ 34.0 34.1 34.2 34.3 34.4 34.5 34.6 34.7 Usha Rao, U. Fehn, R. T. D. Teng, Fraser E. Goff. 1996. Sources Of Chloride In Hydrothermal Fluids From The Valles Caldera, New Mexico- A 36Cl Study. Journal of Volcanology and Geothermal Research. 72(1):59-70. ↑ 41.0 41.1 Fraser E. Goff,Dennis L. Nielson,Jamie N. Gardner,Jeffrey B. Hulen,Peter Lysne,Lisa Shevenell,John C. Rowley. 1987. Scientific Drilling at Sulphur Springs, Valles Caldera, New Mexico- Core Hole VC-2A. EOS, Transactions American Geophysical Union. 68(30):649-662. ↑ 42.0 42.1 Jeffrey B. Hulen,Jamie N. Gardner,Dennis L. Nielson,Fraser E. Goff. 1988. Stratigraphy, Structure, Hydrothermal Alteration and Ore Mineralization Encountered in CSDP (Continental Scientific Drilling Program) Corehole VC-2A, Sulphur Springs Area, Valles Caldera, New Mexico- a Detailed Overview. Salt Lake City, UT: Utah University Research Institution. Report No. : LA-UR-88461; ESL-88001-TR. ↑ 44.0 44.1 John A. Musgrave,Fraser E. Goff,Lisa Shevenell,Patricio E. Trujillo Jr,Dale Counce,Gary Luedemann,Sammy Garcia,Bert Dennis,Jeffrey B. Hulen,Cathy Janik,Francisco A. Tomei. 1989. Selected Data from Continental Scientific Drilling Core Holes VC-1 and VC-2A, Valles Caldera, New Mexico. Los Alamos, NM: Los Alamos National Laboratory, NM. Report No. : Report No. unavailable. ↑ 50.0 50.1 50.2 Steve J. Chipera,Fraser E. Goff,Cathy J. Goff,Melissa Fittipaldo. 2008. Zeolitization Of Intracaldera Sediments And Rhyolitic Rocks In The 1.25 Ma Lake Of Valles Caldera, New Mexico, USA. Journal of Volcanology and Geothermal Research. 178(2):317-330. ↑ 55.0 55.1 Chandler A. Swanberg. 1983. Geothermal Resources of Rifts- a Comparison of the Rio Grande Rift and the Salton Trough. Tectonophysics. 94(1-4):659-678. ↑ 56.0 56.1 56.2 56.3 56.4 56.5 56.6 Francois D. Vuataz,Fraser E. Goff. 1986. Isotope Geochemistry of Thermal and Nonthermal Waters in the Valles Caldera, Jemez Mountains, Northern New Mexico. Journal of Geophysical Research. 91(B2):1835-1853. ↑ 57.0 57.1 57.2 R L Smith,R A Bailey. 1966. The Bandelier Tuff- A Study of Ash-Flow Eruption Cycles from Zoned Magma Chambers. Bulletin Volcanologique. 29(1):83-103. ↑ 62.0 62.1 K.H. Olsen,W.S. Baldridge,J.F. Callender. 1987. Rio Grande Rift- an Overview. Tectonophysics. 143(1-3):119-139. ↑ 72.0 72.1 Art F. White. 1986. Chemical and isotopic characteristics of fluids within the Baca Geothermal Reservoir, Valles Caldera, New Mexico. Journal of Geophysical Research. 91(B2):1855-1866. ↑ 73.0 73.1 Art F White,Nancy J Chuma,Fraser E. Goff. 1992. Mass Transfer Constraints On The Chemical Evolution Of An Active Hydrothermal System, Valles Caldera, New Mexico. Journal of Volcanology and Geothermal Research. 49(3-4):233-253.